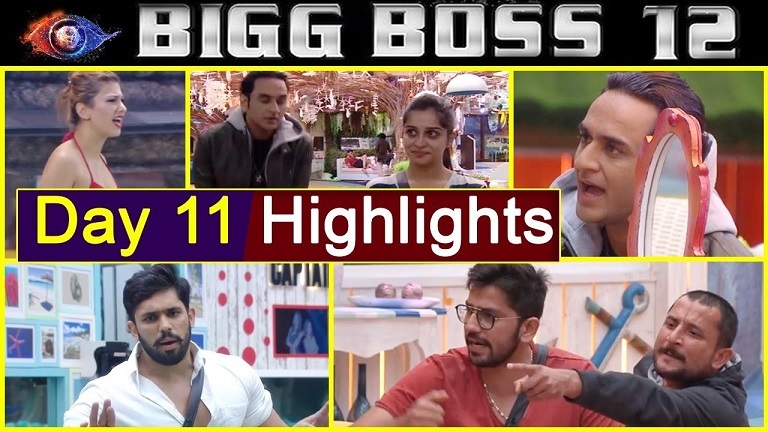 Day 10 of Bigg Boss 12 was certainly one of the most dramatic ones. The luxury budget task turned uglier as singles take their revenge on jodis for what they did a day ago to them during the task. - Next up was Jasleen who also gave up on the task. After the torture, Jasleen calls Dipika cruel and but the latter continues to perform the task. - Since the winning of the tasks came to a draw, the deciding point was on who sat through the torture for the longest time. They singles team sat for 2 minutes extra. After winning the task, the Singles team rejoice and discuss the distribution of household duties. During the conversation, Nehha suggested Karanvir's name for captaincy as he is nominated. Will the others agree? Let’s wait and watch. Moving on to day 11, the contestant was slapped with a reality check by the very own Vikas Gupta, one of the three finalists of Bigg Boss Season 11. Unlike others, Sree couldn’t digest Vikas’s feedback on his performance on the show and even question if Vikas even watched the show in the first place? He further says he doesn’t even know who Vikas is and that he would not be able to survive if he was in his place. After Vikas’s exit, Bigg Boss asks everyone to select two contestants for kaal kothri (jail). This nomination led to huge disagreement and fight where contestants accuse each other of using unfair means to win the luxury budget task. Also, why are we not surprised when Sreesanth once again threatens to leave the show? This time it was because Romil would not accept he was not playing fair in the task. Well, its either Sree is enjoying the attention that comes with the ‘exit’ game or just can’t accept when things don’t go his way.